The Excel Waterfall Chart Generator provides a menu option in excel to generate waterfall charts from data with Excel. Waterfall charts can be quickly generated with a variety of options for style and display for reporting purposes. The Excel add-in supplies and easy to use menu item in Excel. Help material and example files allow fast training and advice for data visualization through waterfall charting. Specify colors to apply to increasing, declining, base and end values in the chart. Apply solid or gradient fills to the waterfall charting. 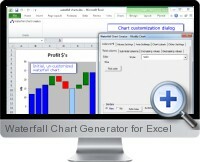 The Excel waterfall chart generator add-in is compatible with all 32 and 64 bit versions of Excel.